Glacier National Park is in the initial stages of developing an ambitions fisheries plan . . .
Glacier National Park Superintendent Jeff Mow announced last week the launch of a two-year comprehensive planning process to address large-scale issues affecting the park’s iconic lakes and streams, including non-native invasive species and climate change. Park officials say the purpose of the plan is to develop an integrated and adaptive approach to the restoration, conservation and future management of native aquatic species and their habitats across the park, including the federally-listed threatened bull trout and the state-listed westslope cutthroat trout. To submit public comments online or view the scoping document, visit parkplanning.nps.gov/FishAquaticsPlanEIS. Comments can also be mailed to: Superintendent, Glacier National Park, Attn: Fish and Aquatics Plan/EIS, P.O. Box 128, West Glacier, Montana 59936. Rising water temperatures and general problems with access to clean, fast running water are affecting trout populations globally . 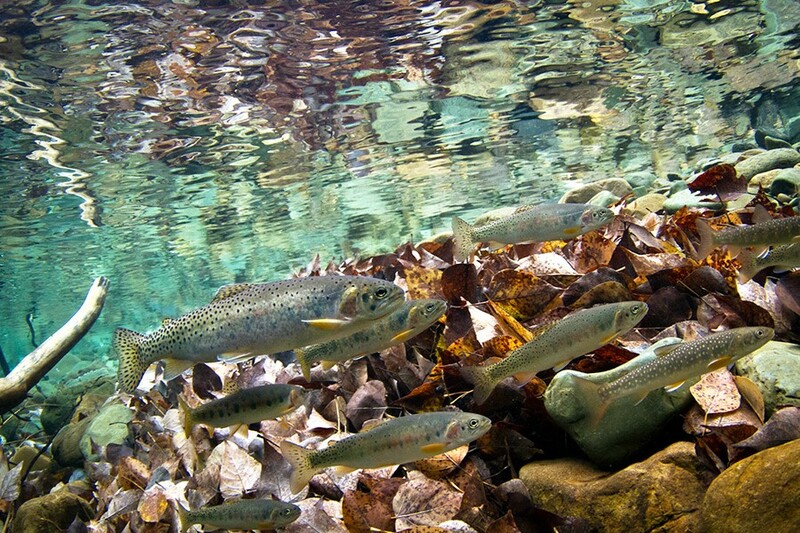 . .
Temperature-sensitive trout thrive in water that is cold, clear and abundant – not exactly groundbreaking news. But a recent study tracking the relationship between warming climes and the adverse effects on global trout populations is the first to establish a scientific connection. In the study, titled “Impacts of Climatic Variation on Trout: A Global Synthesis and Path Forward,” lead author Ryan Kovach and his colleagues provide the first global synthesis of trout responses to climate change over time. Despite the economic, cultural, and ecological value of trout, Kovach said long-term data comparing the health of trout populations to changes in streamflow and water temperature are surprisingly limited. Bull trout numbers are down in this year’s survey, but changes to stream flows may account for most of this . . .
Low flows and stream blockages may have contributed to some lower-than-usual spawning results in the annual northwest Montana bull trout survey this fall. “In some streams, our annual index sections were not accessible to fish due to debris jams, beaver dams or other flow-related conditions, resulting in lower-than-expected counts,” said Tom Weaver, Montana Fish, Wildlife and Parks bull trout specialist in Kalispell. However, he said the overall count indicates numbers of the federally threatened species remain stable in the region. As mentioned last week, the recent federal bull trout recovery plan is not universally admired, making a lawsuit almost inevitable . 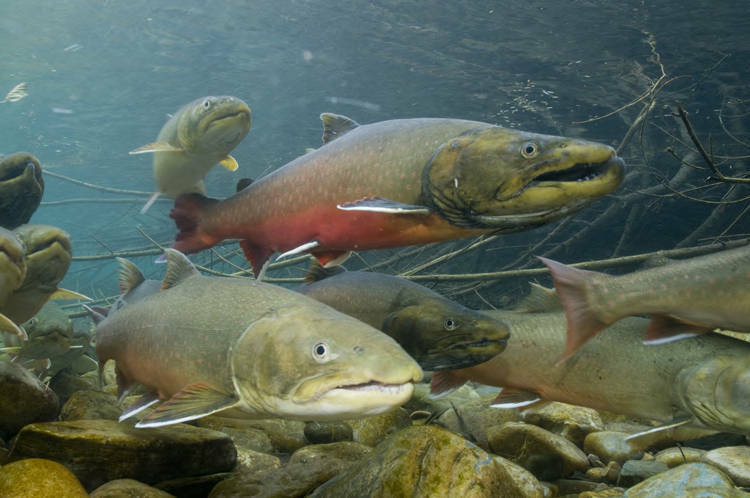 . .
A pair of environmental groups announced Wednesday they will sue the federal government unless a recovery plan for threatened bull trout is amended to address violations of the Endangered Species Act. The groups, Alliance for the Wild Rockies and Friends of the Wild Swan, filed the 60-day notice to sue a little more than a week after the U.S. Fish and Wildlife released its final Bull Trout Recovery Plan on Sept. 28. A 60-day notice to sue under the ESA is required in order to provide enough information to the FWS so that it has the opportunity to identify and address alleged violations in order to make the plan sufficient. The long-delayed federal bull trout recovery plan was released this week . . .
More than 15 years in the making, the final recovery plan for bull trout was released Monday by the U.S. Fish and Wildlife Service, although some environmentalists and biologists in Montana say it still falls short of providing an avenue to recover the threatened species. Listed under the Endangered Species Act in 1999, bull trout populations in the continental U.S. have struggled throughout the past century, under pressure from invasive species, habitat degradation and warmer waters. The warming effects from climate change are also expected to create further problems for the fish, which require clean, cold water to survive. Steve Duke, a senior biologist with the U.S. Fish and Wildlife Service, said some current bull trout habitats will no longer be habitable if water temperatures continue to rise as projected. That’s one reason the plan language that allows up to 25 percent of the individual populations to disappear within four of the six geographically defined recovery units. The feds released a draft version of their plan for bull trout recovery yesterday, starting the clock on a 45-day recovery period . . . The draft master plan for removing bull trout from Endangered Species Act protection was released at 12:01 a.m. Tuesday, after 16 years of work and protracted legal battles. The FWS plan is out for 45 days of public comment. It must meet a court-ordered settlement deadline for acceptance by Sept. 30. Two previous plans developed in 2002 and 2004 were deemed inadequate. Looks like Glacier Park is seeing success in eliminating non-native lake trout from Quartz Lake . . . Since 2009, biologists from the U.S. Geological Survey and Glacier National Park have been netting non-native lake trout from Quartz Lake to help preserve one of the Park’s last remaining strongholds for endangered bull trout. The effort, biologist Carter Fredenberg was pleased to report last week, appears to be working. Last fall, biologists counted an historic high 66 bull trout redds in the upper stretches of drainage. Redds are spawning beds fish make in the stream bottoms. The more redds, the better the population is doing. “That is extremely positive,” Fredenberg said during a public talk last week. This is a more extensive report on the bull trout population than the one posted earlier . . . The bull trout population remains stable in Northwest Montana, according to state biologists who completed their annual inventory of spawning sites. Montana Fish, Wildlife and Parks recently released the results of its annual survey of the Clark Fork, Flathead and Kootenai drainages, and the data shows that the bull trout population has not experienced any significant changes, Regional Fisheries Manager Mark Deleray said. The Region 1 bull trout redd counts are in . . .
Montana Fish, Wildlife & Parks (FWP) Fisheries Field crews have completed the annual inventory of bull trout spawning sites in the Clark Fork, Flathead, and Kootenai drainages, which comprise northwest Montana’s FWP Region One. Experienced observers walk known spawning areas and count the number of spawning nests called redds. Female bull trout excavate a depression in the streambed where she deposits her eggs which are immediately fertilized by a male. These nests, called redds, are typically four to six feet long by three feet wide, or even larger and are easily identified when walking down the stream channel. Redd counts are indicative of the abundance levels of spawning adult bull trout each year. Redd counts are used to assess status and trends in bull trout populations in northwest Montana. According to Region One Fisheries Program Manager Mark Deleray, there are no surprises in the 2014 bull trout redd counts for the Clark Fork, Flathead, and Kootenai drainages in Northwestern Montana.